Many of you may have tried out multiple Twitter clients before settling on the one best for you, but did you know that Twitter restricts the number of users that can access Twitter from these third party clients? It’s called their Token Limit and it can be a real problem for some popular Twitter clients. If you aren’t using these apps anymore after you've tried them out then you might want to consider releasing your token. Last year Twitter decided to restrict how developers could use their API and one of the things they decided was that they didn’t want developers to “build client apps that mimic or reproduce the mainstream Twitter consumer client experience.” They acted upon that statement by putting a 100,000 user limit on third party Twitter clients such as Falcon Pro, Carbon, and others. So what does that mean for you? Well, if you’ve installed and uninstalled multiple Twitter apps then you may have a token given to you that you aren’t using, which means someone else could use it. That’s why you should release your tokens if you aren’t using them. Head over to Twitter and make sure you’re logged in. Click on the gear icon in the top right corner and hit Settings from the drop-down. On the left-hand side, near the bottom, click on Apps. This is where you’ll see every app that you’ve allowed to access to your Twitter account. To release the token you’re using, simply click on Revoke Access next to the app and that’s it. Not only are you releasing your token to some other person that wants to use these clients, but this is a good chance to revoke access to other older apps you aren’t using anymore that have access to your account. You can breathe a little easier now knowing that these developers can distribute their apps to people who really want to use them. I had quite a few apps built up in my permissions and I was glad to finally clean them out and release the tokens. I’ve tried out my fair share of Twitter clients before finally settling on Falcon Pro. 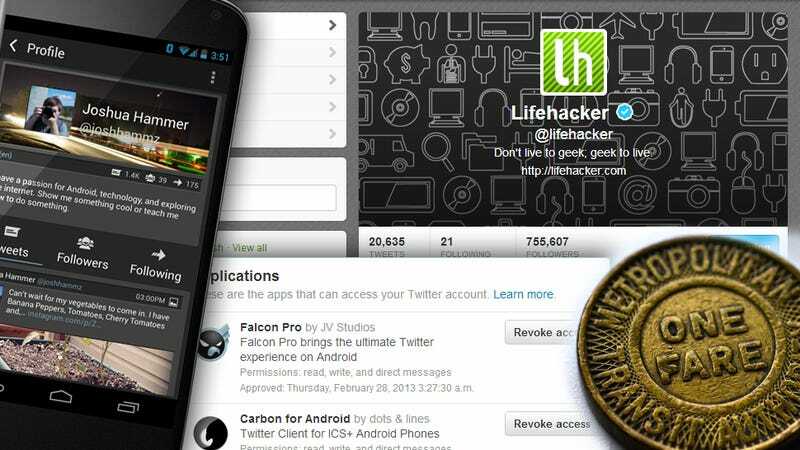 What Twitter apps did you revoke access to? And which ones did you decide you should keep around? Let us know in the comments below! Images remixed from slgckgc and Google.